The thick keel is integral to a compact fin with superior propulsive power. Also recommended for beginners and underwater photographers. Numerous materials were tested to find the optimum hardness for a fin that is a breeze for anyone to use. Provides agility and comfort when moving underwater. 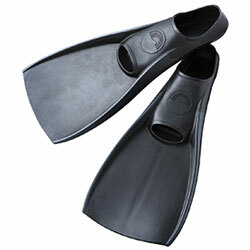 Also reduces the risk of kicking up dust on sandy bottoms, making it great for beginners and underwater photographers. The foot pocket includes grip points that help transfer the force of your foot to the fin. 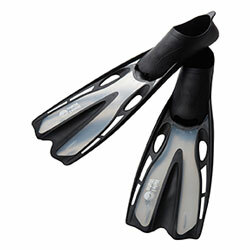 The grip points have a larger effect when wearing the fins barefoot than when wearing boots. A curved shape improves the fit against your heel. Getting the fins on and off is easy and stress-free.